Trinity Lutheran Church of Davison, Michigan is a member congregation of The Lutheran Church – Missouri Synod. Trinity was founded in 1941 to “… seek the honor and glory of God (Romans 15:6), to carry out His will, to manifest the unity of our faith in Jesus Christ as God and Savior, to spread the kingdom of God and to foster the Christian fellowship and love, the preaching of the Word of God, by the administration of the Sacraments and by the religious instruction of all its members, according to the doctrinal standard of the Evangelical Lutheran Church” (Constitution of Trinity Lutheran Church, Art II). 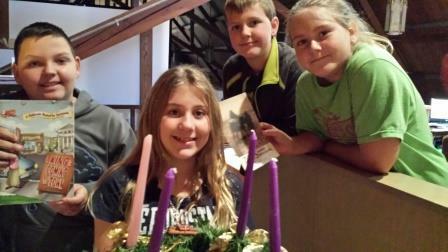 The teaching of Trinity Lutheran Church is Christ-Centered and Bible-Based. We accept the 39 books of the Old Testament and 27 books of the New Testament as the inerrant, inspired Word of God. We submit to the Bible as the only source of “infallible authority in all matters of faith and life”(Constitution of Trinity Lutheran Church, Art. III, A). We also accept the “confessional writings of the Evangelical Lutheran Church contained in the Book of Concord of the year 1580 as true and genuine expositions of the doctrines of the Bible. These confessional writings are the three Ecumenical Creeds, (Apostles’, Nicene, and Athanasian) the Unaltered Augsburg Confession, The Apology of the Augsburg Confession, the Smalcald Articles, Luther’s Large and Small Catechisms, and the Formula of Concord” (Constitution of Trinity Lutheran Church, Art. III, B). Members of Trinity Lutheran Church realize that being a Christian means more than just being a member of a church and attending services once a week. The people who call Trinity Lutheran Church their church home strive to live as disciples of Jesus Christ every day (Luke 9:23). Each of us is far from perfect. We understand that we are sinners (Romans 3:23). We also believe that we are forgiven by Jesus who died for us. Because we are so loved by Jesus, we love Jesus and others (1 John 4:19). Our love for Jesus and others is lived out through worship, Bible study, prayer, serving others, and encouraging others. The members and friends of Trinity Lutheran Church in Davison invite you to grow with us in a relationship with Jesus Christ. If you are interested in learning more about being a disciple of Jesus and growing in your faith, we would love to hear from you. Please join us in worship, phone us at 810-658-3000; send us an e-mail; or drop by to let us know how we can help you. We look forward to meeting you and pray that our congregation will be a blessing to you and your walk with God. Trinity Lutheran Church is committed to glorifying the Triune God and expanding His kingdom by Growing in God’s Word and sacraments, Serving one another and Sharing with all people the Good News of Jesus Christ .